Forum Description: Got a high score, post it here! My voice sounds really loud because the camera is right above my head will need to adjust ingestion levels on microphone next time. Nice work on this, anything under 3:25 is great! Really like how you do some of the turns on the Forest stage. I use gear 2 on most of the turns on the Mountain stage, which I find works a lot better than 3rd gear. Cheers mate, a few corners are still getting me I can do better than this but I'm struggling to tie three good laps together. Still struggling with Lakeside tho' I did do a 1:12 yesterday on that. Oh I know some turns are a pain to get right, just got to try things out and see if they work really. Here's a video I did some time on the PS2 port, getting 3:22:82 http://https://www.youtube.com/watch?v=7Sz1c2GnIyY" rel="nofollow - http://https://www.youtube.com/watch?v=7Sz1c2GnIyY I wanted to get 3:20 or less but I'd have to be really lucky to get that low. Have never really bothered with the Lakeside course as it doesn't affect your scores. Just watched your vid steven, those enemy cars are placed a lot different on that version and go a lot slower, don't get in your way as much as the real one it would seem. 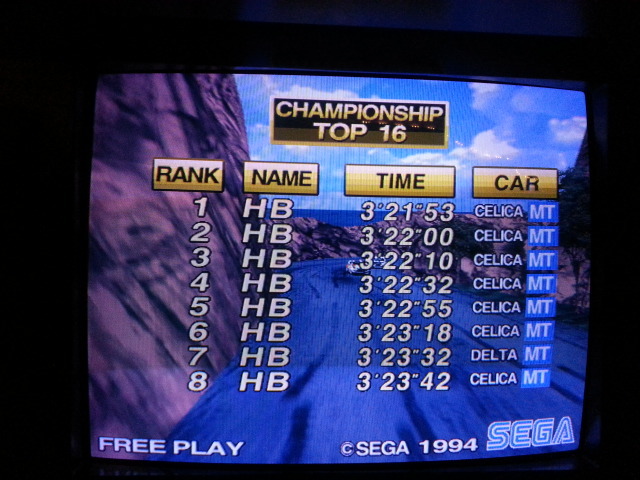 Used to be able to get under 3:23 on the Saturn version. Want to keep practicing. you are way better than me, I need to practise! Nice. 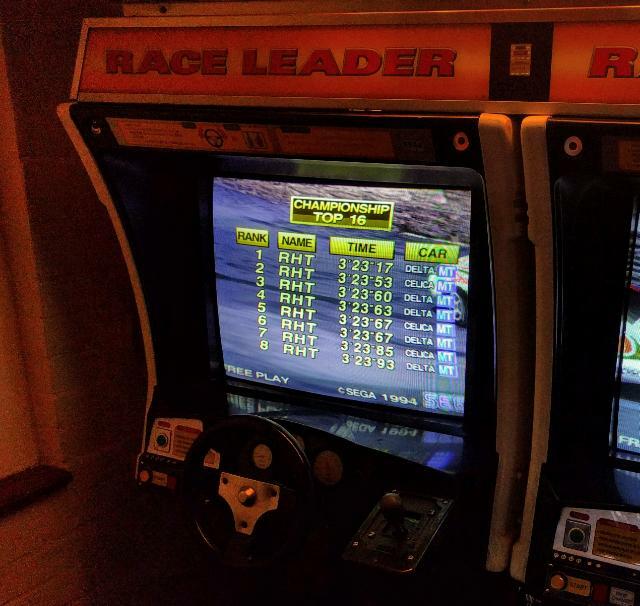 Ive always considered myself the sega rally king but have no idea of my tomes. Ill pop to the barn after autosport and have a play and a video :). Ahh didn't realize it was AM2EMU. I have that setup too on my rig so Ill do it on there. Nice and easy and warmer for me too! 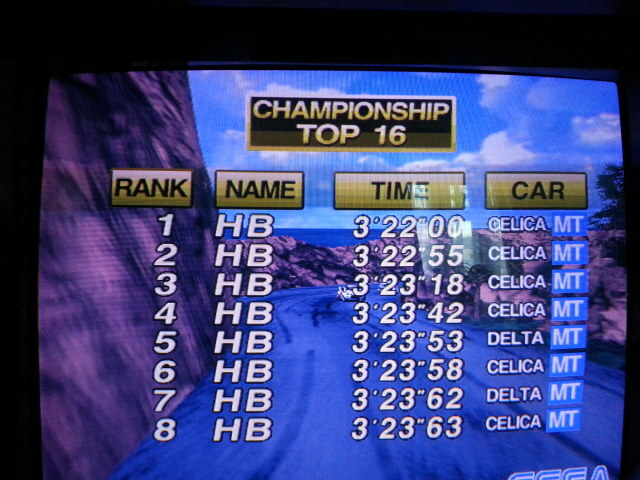 I did a 3:22 at play expo and it crashed shortly after and lost the score. Got a pic of it though. I find the cars behave differently on different settings on the arcade version, they can be a pain. Martin I'm running actual hardware here, what I mean't was I'd be interested to see other hardware based scores. Nice, I'm sure I can get down to those sort of times with a lot more practice. If only I wasn't so tired when I get home from work , find it difficult to concentrate. Managed another sub 3:24 game today, getting some corners really nice now, some I've still not got a groove for. Yeah, just got to reduce the amount of mistakes per run, and somehow do turns with losing less speed, which is pretty difficult. Have played the PS2 port a bit more today, getting 3:22 on every run but can't get any lower. that certainly gives me something to aim at. Looking back at my runs, I should be able to do 3:19.9 if everything went as well as possible! whats the fastest possible on this game? Can I join the club? Driving games are my favourite thing. 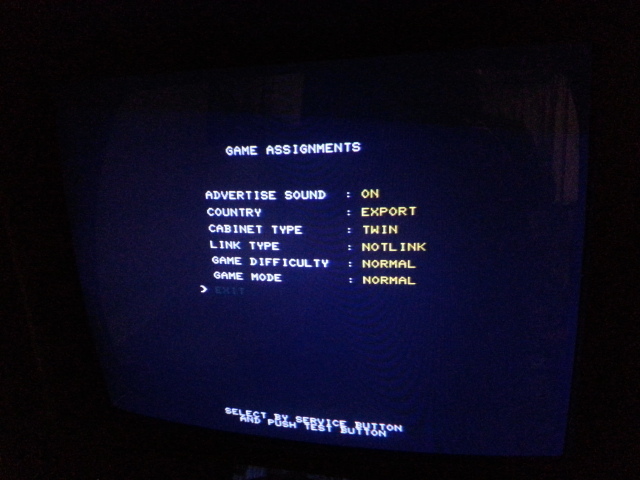 This one was set on the emulator, not fortunate enough to own the hardware. Of course, is that with the normal car or the Stratos? Either way it's a fast time! The video I linked is from a VHS recorded in 1997, I don't think it is using the Stratos. If you do use that car, then the scores don't show up on the normal table, and it doesn't show the "Championship Top 16" graphic on the screen that I have been showing on my scores, sadly the video doesn't show any of these. Never knew about the Stratos, just going to have a look for that one. I knew about the stage unlock, that's about it. Time was set using the Lancia on AT. I'll get another photo up, I'm always under 3'-20". My version doesn't support the high scores in attract mode for some reason. I've got a 3'-19"-53 on the my phone though. 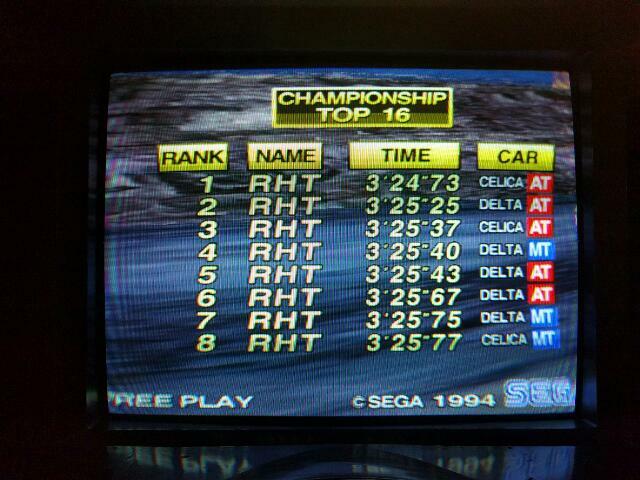 Thought there was no Stratos in the arcade version - it's a Sega Saturn cheat. Can't find any reference to it. It's there but you don't see it reflected in the model. On the gears, go 1st,2nd,3rd and 4th - you will now hear a "whoosh"
this doesn't change the model on screen, but you'll soon see it accelerates like made and is driven from the back wheels. 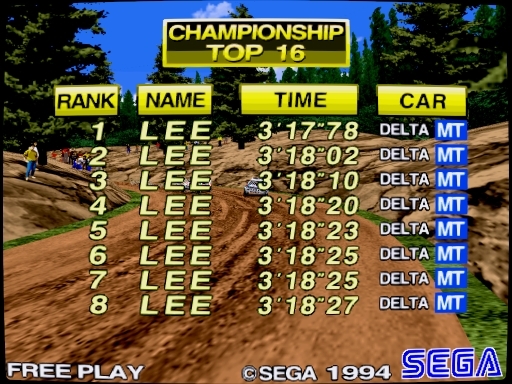 Scores are held in a separate score table when using the Stratos. 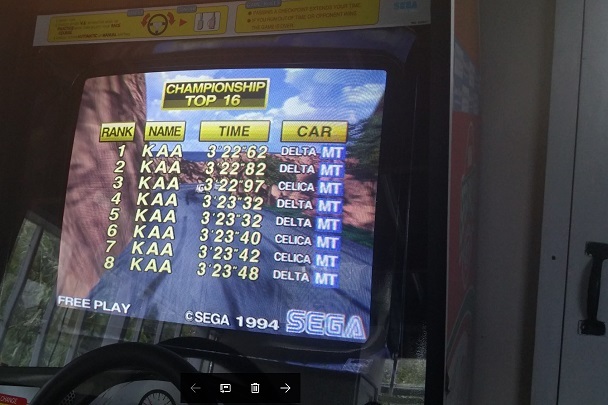 I'm emulating Sega Rally but it's in a proper Sega Rally sitdown cab, am I allowed ? What settings have you got the game on in the test menu? Will get a lap or two in tomorrow night! After a couple of weeks of no streaming because of hard disk death, I'm back. played some really rubbish games and haven't improved on my 3:21:53 but managed a sub 3:22 on camera. Still haven't sorted the sound out yet, so quiet vid. This was a very scrappy run. Really nice work on this, some of the turns go really well. Have noticed you change the gear into 4th really late though. Just did a little better. 3:21:42 Muerto can you update the tables again please? Nice work again, well done on that Desert time, it's almost perfect. The forest stage didn't go so well, and it's usually the same for me too, on all those turns. Got two webcams setup now so you can see my ugly mug . Also think I've got me sound settings sorted now. Impressive times aside, it was just as much fun watching your expressions! Much better hearing the sega sounds as well. What time are you aiming for? 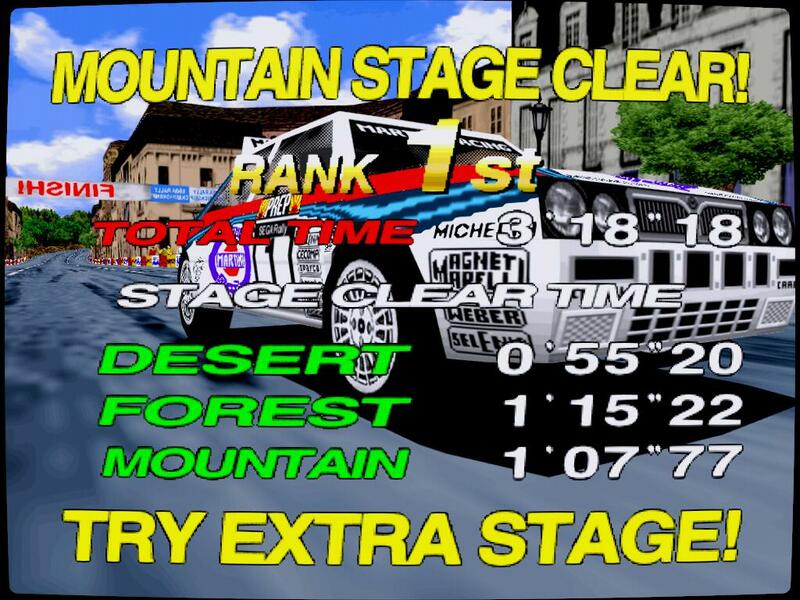 Had a good crack at it and on the third I managed to clear the Mountain stage ! My first times were in the 3:28's. It doesn't matter whether you use the celica or delta but stick to one machine as they handle subtly differently. You'll find it tricky until you get used to changing gears without thinking and you've gotta learn the courses obviously. 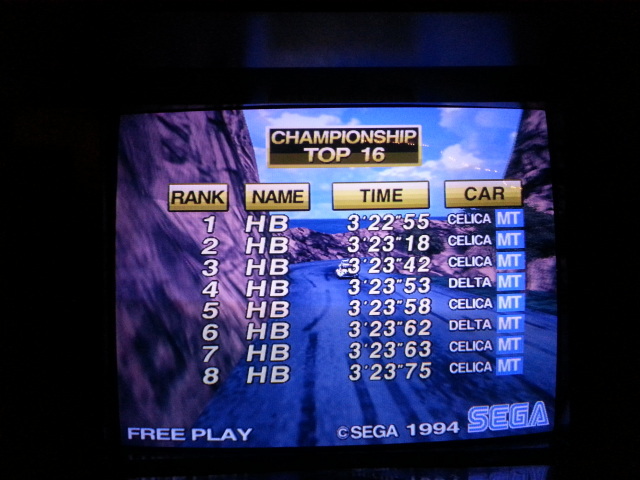 Had a few goes on my Sega rally after rebuilding the power supply and managed to beat my best time by 2 hundredths of a stir second. Was just a quick go so not streaming unfortunately.. But watching your playthrough had given me loads of areas where I could improve. So thanks very much! Couple of quesitons - is the consensus that the Celica is faster than the Delta? Seems that way for me. And what do you reckon is the absolute fastest time possible with a perfect run? My scoreboard (before my machine died) required sub 3:22:50 to get in the top 16. Haven't had any time to play much lately. Assumng you don't use the Lancia Stratos (although that does keep a separate score table). 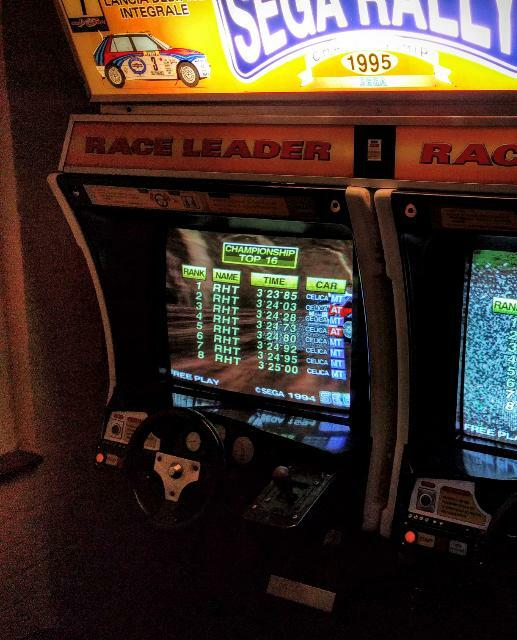 Great thing about this game is the handling and you can always chase 3 perfect laps. Thanks - it's good to know what to aim for! Awesome desert time. I need to put some serious practice in with manual transmission. I've played it a fair amount on the model 2 emulator version as well, but that seems to run faster and has different positioning of the opponents, so I'm not sure it's really comparable with the arcade. Yeah seen some silly times done on Model 2, and the cars are in easy position it appears by default. It was like playing monkey ball on the gamecube the timing was fixed to refresh so the timer ran at different speeds in 50Hz and 60Hz modes. 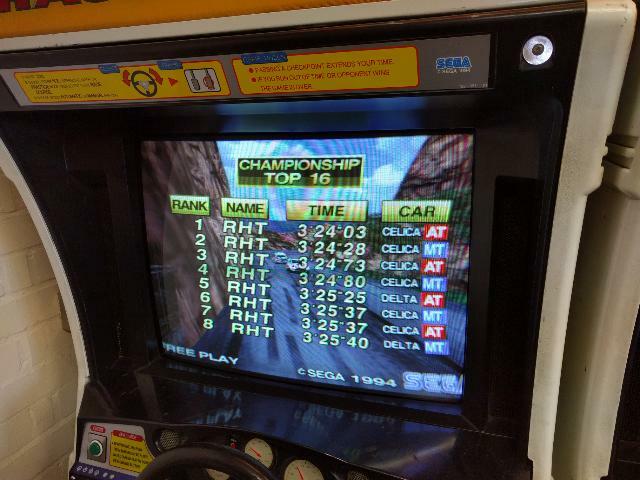 Just recorded a quick video of Sega Rally for my students (we do a unit on arcade history). Thought I'd have a go at playing automatic while trying to film on my phone didn't do that bad, the filming is rubbish, it's hard trying to play and keep looking through the phone to see where you are waving it. Impressive single-handed racing! Some kind of head-mounted wide-angle camera would be useful. I did strap my phone to my head for a mame pc demonstration i did! 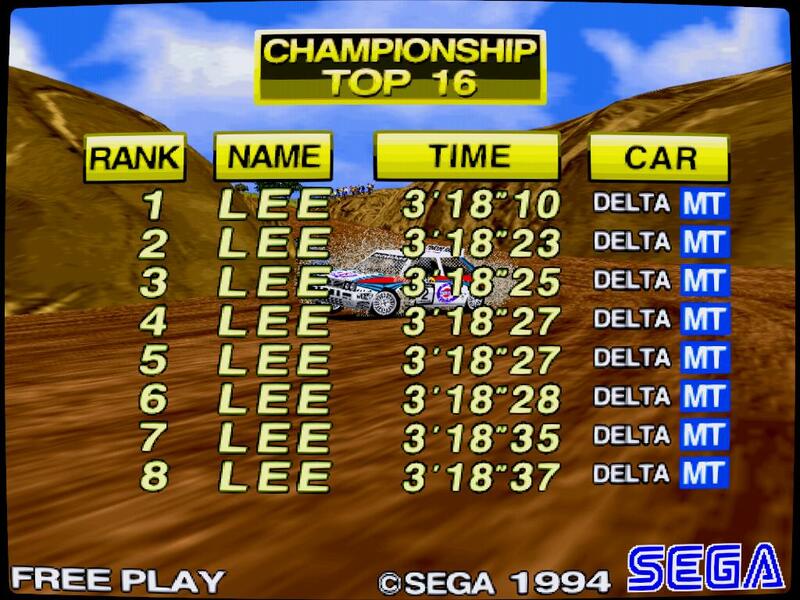 I got back to a bit of sega rally the other day after not touching it for a month or so. getting closer to breaking the 3'24 now. i had a few scrapes on my best MT time, so I'm sure that can go under 3'24. The AT time seemed like a really smooth run, but could probably have been a bit more aggressive with some of the turns. I finally got into the 3.23s, which means my fastest manual gears time is faster than my best automatic. Having watched your video more HB, you go down into 2nd gear in lots of places where i only go down into 3rd. I've been worried about losing speed, but I guess you get better traction and a better line. Also - should I be using the Delta? 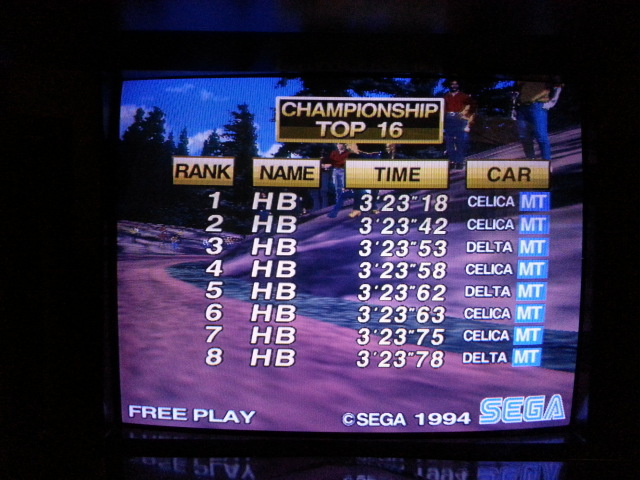 I switched to the Celica a while back as it seemed slightly faster, but your best times are with the Delta aren't they? Well done, you will improve from there for sure. Love this thread and some very impressive times gents. Given me some motivation to get my finger out and push for better scores. I've plateaued at almost bang on 3:25, but could easily do better with some consistency and stopping the careless plinks and scrapes. That was in January and I've not got close to it since. I wish there was a quick restart option as i know I've blown it by the third corner on desert! Good time nik, once you dip below that you will improve. I've been watching runs on YouTube for a while and one person I was curious about (They had a 3'18 run also) I asked them if they were using the secret car (which I never use) and they said no, but after trying out the car and seeing how much it fishtails when you drop to 3rd gear, I could almost be certain that they used it. So when I called them out and asked why would they lie, they just removed the comments. But anyway, I've seen a 3'15 on there with the normal Celica, so I don't believe in the secret car anyway. The timing on model2 is way off. The car moves miles quicker than on the actual machine. True, i prefer the Saturn version to the model 2 emulator version as far as home versions go. Seems closer to the arcade. I haven't tried it recently but the ps2 version of Sega rally that came with Sega rally 2006 might have more accurate emulation. I've spent quite a lot of time on the PS2 version and on an actual machine, it seems almost the same. Must add that there are 2 revisions on the Model 2 emulator and one is faster than the other, and there is talk about it needing the region set to Japan too. 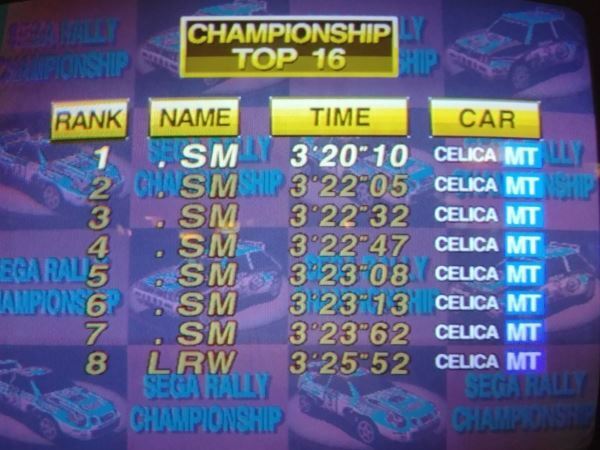 You can tell if someone has used the Stratos as the high score table displayed doesn't show "championship top 16"
I don't believe they're faster at all although there is a difference in the AI car placement or speed. Don't know if that's an emulation bug because the romset, region or game options don't seem to change it. If they were like the arcade, then I could possibly a get faster time still by bouncing off them but they're not there. They way I play is basically the same as someone I watched on an arcade machine, same technique, which is different to Hurray's and they were getting 3'18s too. Do anyone of you wall bounce?? I'm most curious about the 3'18'98 posted, which was automatic(?) I really didn't think it was possible to do like that. I also have the same time, but again, MT (normal) Delta with lots of gear shifts and wall bounces. 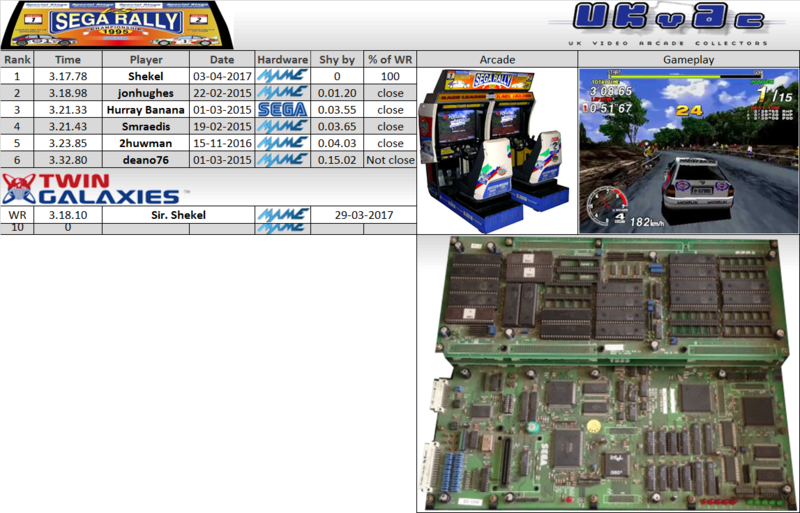 To add, I would like someone to prove (for my own sanity too) that the Model 2 emulator is indeed faster or whatever it is compared to arcade. Mind, it has to be running at 57.5Hz. Which 3:18 video are you on about? Not one from this thread. That's impressive. I'll try the wall bounces! Maybe the model 2 emulator version just seems faster because it was running at 60hz. But the car placement is definitely off. Ahh, was wondering if it was that one. That doesn't use the secret car, but he sure seems to drift well when in gear 3. Here's what the score table should look like if you use it, see the Championship image is missing. That's all I think it is and even if the car placement is different, it's not making anyone any faster, that's just better technique. I've seen the technique of 2 players in this thread so I know why I'm faster. Smraedis! I don't know if you're asking to see my championship table or not. You can if that would please you, but I have to say this long-winded thing first. Unfortunate for me that it's happened just recently, but at the end of the day these times aren't even that fast anyway so for me it's actually a non-issue. Right, I'm not sure what's happened lately with my M2 emulator. I think my NVRAM data may be somehow corrupted. I played SR a fair bit recently and have since momentarily quit because no matter what score I get, it's not being saved. The last score I have on the championship table is a 3'18'90 http://i.imgur.com/fMenUH4.jpg" rel="nofollow - http://i.imgur.com/fMenUH4.jpg . The Time Difference mode (which is quite helpful) isn't working right either, it's not showing split times any more, so this is the other reason. I can only think this may be because I reset the game to quickly get back into it, but even still, some scores are missing like the 3'18'98 which was my first sub-3'19 so that confuses me why it's not there. But anyway, I just screenshot individual times because it's more interesting to me. Btw, the time johnhughes got was accepted and the championship table wasn't shown. 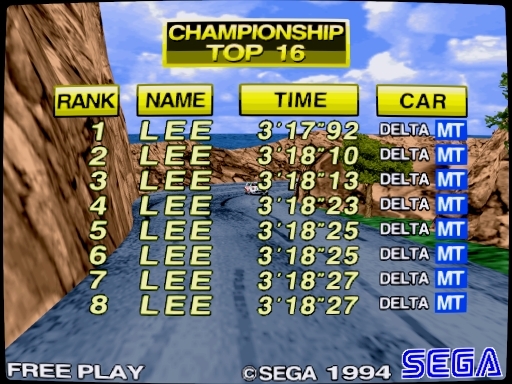 If you play as the secret car, that little top 3-scores is its own thing so doesn't prove which car someone used. But as I said, I don't believe in the secret car. Oh I'm not accusing you of using the slidy car, I'm just pointing out that you said the person in that video was using it right? It seems most of my time lost seems to be on the 3rd stage. Oh, no. I get what you mean now. The last video I posted - That was basically my technique. Normal car. Guess you were asking for this one - Where I called them out but they removed the comments. Well, I decided to start a fresh NVRAM file to fix my problems and start setting times again. I would love to get a 3'17 time but this 3'18"10 is good enough for me right now. It took ages to get right. Please add it to the first page. While the scores are updated, I really think there should be a distinction between which formats we're using. For a start, MAME is wrong, no one is using that and Smraedis, your time was achieved on a PS2? Wow! Great times across all formats. Is this with bouncing off the hairpins? Certain turns, yes (not the mountain hairpin, though). I wouldn't play it any other way now. Good job Smraedis. I'm glad you improved your time. We can all be faster. Finally got a 3'17 and it's good that I got this screenshot because it's not saved it..
EDIT: Yeah, so I thought I was going to have to start a new save file again and I did (which is quite annoying), but long story short, the file's not corrupted, it just won't save anything new through LaunchBox for some reason. If I use the original launcher, it's ok. It's doubtful anyone will have the same problem, but just in case, don't use it for this game. I had to work to get another 3'17 back on the board. The 3'18"13 was from the same session as the shot above so that's why it's also gone. Some impressive times here for sure, trying to copy some of your lines and I'm slowly getting my own times down, have now got a couple of 3.23s. There are definitely two areas I can improve on, the final corner on the desert stage, where I either go wide exiting the corner or lose too much speed if I try and keep tight. I also have trouble getting cleanly past the red and green car on the forest stage, they seem to bunch together after the hairpin. think I'm losing a second there. Slowly getting there, into the 3.22s now, still losing some time on the Forest stage, although getting past the green and red car near the hairpin more cleanly. Really good times there. I've plateaued in the 3.23s for now but know I can improve with more consistency. 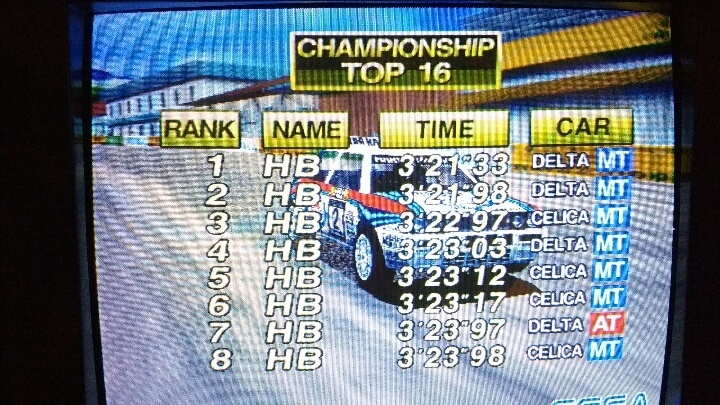 Managed to get a sub 3.22 on cam at the weekend, still have a couple of turns on the desert stage that I'm not happy with. Thanks matey, what's the best time on Hardware at the moment, have you bettered your 3:21:33? Also, are you playing on hard mode, because you seem to have a lot less time than I do playing on normal? Yeah I'm not a massive fan of that either, plus my upright has a sequential shifter so its hard to be in forth, bounce and get back down to 2nd to take off again quickly enough. Cheers matey, I have tried approaching those forest corners in a number of ways, occasionally by going wide and cutting in onto the grass and wide again I can do it fast enough to overtake the blue/red/white car on the corner, but I cant do it consistently. Yeah I have it set to hardest, If I mess up a lap and want to start again I was getting bored of waiting for the countdown to finish, it doesn't seem to effect anything other than the time. Still losing time on the last two corners of the forest stage and I'm sure there is time to be made up on the long desert corner. Have also been experimenting with different lines on the corners on the Forest stage before the tunnel, I'm now convinced going wide on the approach is the quickest line. Thanks matey, what's wrong with yours? awesome . you didn't happen to video it did you? would love to know where you pick up that much time.